Today starts with a pick up from your Darwin accommodation around 9am. Listen to interesting commentary about the region from our knowledgeable guide as we make our way to Fogg Dam Nature reserve. Originally set up as a large scale rice growing project in the 1950`s, this location is now a haven for many varieties of birds that we get a chance to admire. A short drive from here takes us to the “Window on The Wetlands” information centre where you can enjoy a hands on display explaining the wetlands and get a fantastic view over the Adelaide River floodplains from their upper viewing deck. 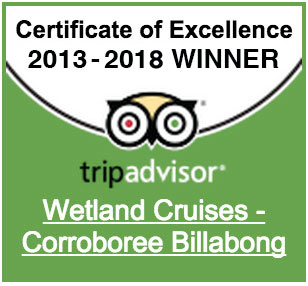 Your highlight for the day is an amazing 2.5 hour cruise on the wetlands, viewing an abundance of birds, crocodiles and wildlife in their natural habitat. Enjoy a delicious lunch on the wetlands surrounded by nature at its best as we get “up close and personal” with plenty of local wildlife. From here it is just under 90 minutes drive to return you to your Darwin accommodation around 5pm. 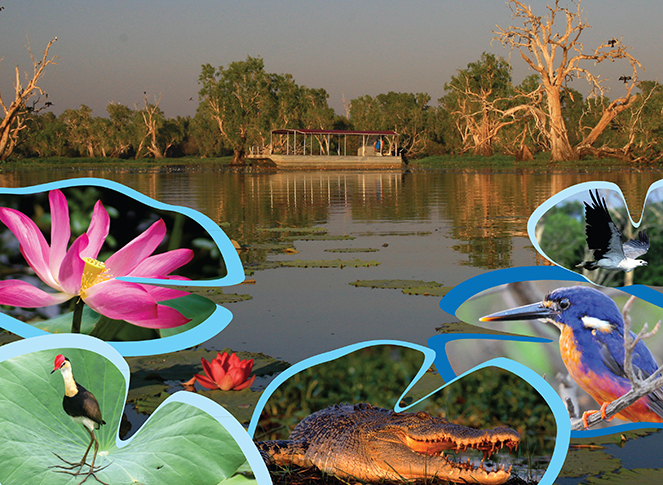 Tour includes 2.5 hour lunch cruise, hotel pick up & drop off, air-conditioned transport and experienced guide. Our vehicle carries a maximum 20 passengers and our boat carries a maximum of 29 passengers.